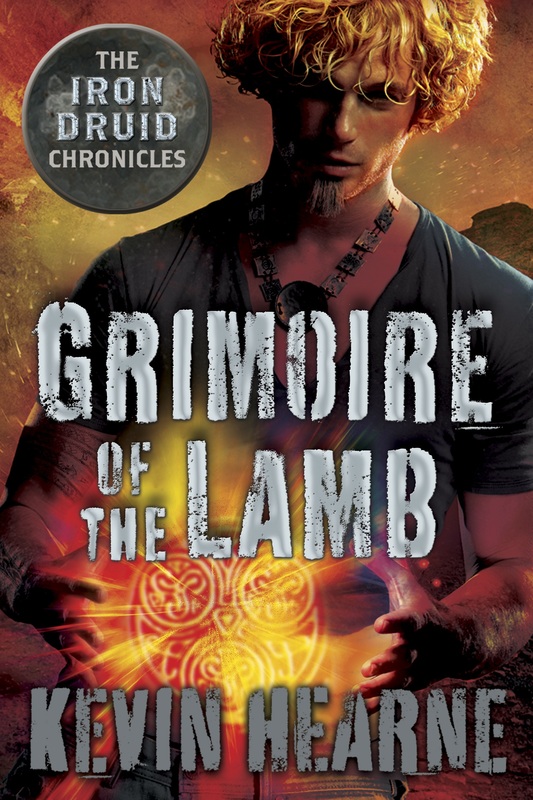 Today, The Poisoned Martini is reading Kevin Hearne’s novella, Grimoire of the Lamb. Atticus O’Sullivan looks twenty-one years old, but he is the centuries old druid Siodhachan Ó Suileabháin lying low in the desert clime of Tempe, Arizona. When an evil sorcerer steals the titular grimoire, Atticus travels to Egypt to get it back, but will he be able to avoid the angry goddess Bast and her phalanx of felines? This novella is considered a prequel to Hounded, the first novel in the Iron Druid Chronicles. The events take place four years prior to the start of that novel (previously reviewed on The Poisoned Martini). Follow along as I review the novella LIVE! This post will be updated (with time stamps) as I progress through the story and share my thoughts firsthand. Wondering what a Live Read is? Check the end of the post for details. Atticus, who has been around since before the Library of Alexandria burned, goes on to tell us the real scoop and how Egyptians “practiced some of the blackest magic history has ever seen” and their keeping it secret. Nkosi is asking about “a collection of recipes for cooking lamb.” Atticus refers to it as the Grimoire of the Lamb. It apparently doesn’t have an actual title. It’s also written in Coptic. I swear every time I type “grimoire”, I think I’m spelling it wrong. The grimoire (oh, that word again!) has thirteen recipes for lamb. Atticus tells Nkosi he has it, but the buyer will have to pick it up in person. Nkosi balks at that. Atticus mentions that he can’t send “magical” items in the mail. A week later, the Egyptian arrives. And he’s a magic user. “I knew immediately, because the wards on my shop warned me,” Atticus narrates. Atticus delays him to an afternoon appointment, claiming the book isn’t on site. Then he calls his lawyer, Hal Hauk, who also happens to be a werewolf. Time to do some background checking up on the Egyptian. Something he should have done before the guy showed up! He heads home, greets his Irish wolfhound, Oberon, and uncovers the ancient Fae sword, Fragarach, “that forces targeted dastardly types to answer questions truthfully.” I should note that this sword plays a pivotal role in the series’ first book, Hounded. Using the sword, Atticus learns Nkosi is searching for the lost book of Amun, which contains recipes to alter fate. Atticus discovers the “lamb” used in the recipes isn’t literal. Love how some of the questions Atticus asks are off-topic. Some great humor there. Some interesting details about the grimoire’s author, the sorcerer Nebwenenef, and his actions which led Gaia to create Druids. They’re spotted by a feline in a marketplace. It may be the early hours (around dawn) in Cairo, but the scene of Atticus and an Irish wolfhound being chased by a horde of cats makes for an interesting visual. I guess even a Druid uses credit cards. Though I wouldn’t call that living off the grid. Of course, when you’re wet and your shirt is in shreds, credit comes in handy. Sarcophagi and more. Messing with an obsessive-compulsive magician. The last lines of the story, tying into the beginning line somewhat, are a great end to the adventure. Atticus barely gets through a thrilling, unusual battle with broken bones and bruises, but his healing ability (eventually) allows him to recover better than his urban paranormal peers in other series. One of the best things about the Iron Druid Chronicles is its use of existing mythology and bringing that lore to life. Here, though Atticus is from the Celtic tradition, readers get a taste of the Egyptian pantheon. Fans of Neil Gaiman’s American Gods would certainly appreciate these stories. In a way the story is all too short, but it certainly makes for an enjoyable evening. I’m a bit surprised that this doesn’t tie in to or hint more about what’s to come in the first book, Hounded. Grimoire of the Lamb was written (or at least published) two years later. Atticus presumably had been living a quiet existence until now, and his use of the sword Fragarach would seem to attract unwanted attention that he’d been trying to avoid. An epilogue could have set up a sort of cliffhanger ending that entices readers to pick up book one. Regardless, I think this is one of the best urban fantasy series out there along with Jim Butcher’s The Dresden Files series. A Live Read is where I review the book as I read it. It’s kind of like writing notes in the margin of a book as you go. After the initial post describing the selected book, I’ll update periodically during the Live Read until the final pages. I intend to avoid any spoilers and certainly won’t give away the ending. Once finished, I’ll give a summation of my overall thoughts. I encourage participation either during the Live Read and beyond. Even if you’ve read the chosen book or not, feel free to chime in with your thoughts about the book, author, or mysteries in general.